Expanding the popular Z-series digital cameras for young-at-heart, trend-savvy consumers, FUJIFILM U.S.A., Inc. delivers flexible functionality and form to active and hip users with the launch of the FinePix Z33WP digital camera. Perfect for budding photographers who want to experience life to the fullest, the FinePix Z33WP enables users to capture those precious moments, regardless of the conditions and share them easily with their extended network of friends and family members. 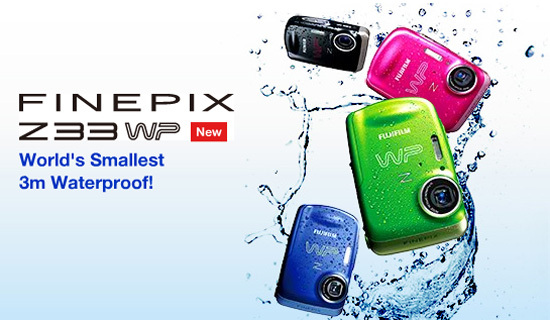 The 10-Megapixel FinePix Z33WP is available in three striking colors – green, pink and black – and is ready for any adventure including underwater activity up to approximately 10 feet (3M)! A 2.7”, 230,000 dots resolution LCD screen – the largest of any Z-series camera yet – and Fujinon 3x Optical Zoom lens allows for a clearer view of those not-to-be-missed moments on the beach, on the ski slopes, hiking in the mountains or boating at the lake. It’s also perfect for everyday activities in the rain, the pool or any other place you might think twice about taking a conventional digital camera. Adding ease to outdoor navigation, the FinePix Z33WP is equipped with a new SR Auto (Automatic Scene Recognition) mode that enables the camera to intelligently recognize six types of scenes automatically. For each picture taken in this mode, the Z33WP will optimize the ideal exposure, focus, white balance and ISO for the scene to ensure the best quality picture is captured with ease. In addition, Fujifilm’s Picture Stabilization is powered by high sensitivity for faster shutter and operational speeds to help reduce camera shake, keeping real life moments as true to form as possible. The family-friendly Z33WP also features Fujifilm’s handy Blog Mode which allows for easier sharing with friends and family members. The Blog mode automatically resizes a photo to a standard 640×480 pixels (VGA) or 320×240 pixels (QVGA) image size and enables 12 in-camera editing features such as Zooming, Miniature effect, Illustration and Painting, cutting the need for extra time with home editing. • Face Detection Technology: Operating in tandem with automatic red-eye removal, the FinePix Z33WP identifies up to 10 human faces in a scene, and sets the correct focus and exposure, regardless of where subjects are located within the frame. • Automatic Red Eye Removal accents the aforementioned features by lending an extra touch to that group shot. The Z33WP automatically checks for red eye and self-corrects it in each and every person in the photo, saving time on post-editing. • Couple and Group Timer Modes: Working in conjunction with Face Detection technology detects two faces in ‘Couple Timer Mode’ and up to four faces in ‘Group Timer Mode’ in a frame. • One Touch MOVIE Button: Capture VGA quality movie clips at 30 frames per second with sound to capture all of those once-in-a-lifetime moments. • Battery Life: The long-life rechargeable Li-ion battery (up to 200 shots) allows for extended use without worrying if the camera is going to last for the duration of the trip. The FinePix Z33WP will debut in late March at a retail price of $199.95. For additional information or hi-res images, go to www.fujifilmusa.com/pma.